When it opens later this fall, the Moxy hotel at 11th and K streets NW will be the latest in the cadre of new, deliberately hip hotel brands arriving in the District in the coming months and years. One difference? Moxy comes from Marriott International (NASDAQ: MAR), which hasn’t historically been on the cutting edge. But Moxy, which launched in Milan and was originally envisioned as solely a European brand, aims to change all that. The D.C. hotel will be the ninth to open in the U.S.; others have already launched in New Orleans, Denver and New York’s Times Square. At the D.C. property, owned by Douglas Development and recently emblazoned with a hot pink Moxy sign in script-y letters, there’s exposed concrete, industrial lighting, plans for a live-updating Instagram wall and local art inside. There’s also a “living room” that serves local craft cocktails and coffee, garage doors that open up to the street to let the lobby spill out onto the sidewalk and two restaurants forthcoming from Baltimore’s Atlas Restaurant Group. The 200-room hotel at 1101 K St. NW, a new 14-story tower attached to a four-story historic building, follows the modern model of much smaller hotel rooms and more common-area space. The rooms, which start at $179 per night, average 175 square feet, comparable to those in recently opened microhotels Pod D.C. and Hotel Hive. Some have exposed brick, thanks to the historic building, and with the upper floors featuring peek-a-boo views of the Washington Monument and other D.C. landmarks. Most are queens and kings, but some have two double beds stacked in the style of bunk beds. The rooms have hooks for hanging items, but no closets. There are steamers but no irons, though guests have access to centralized ironing stations on every floor. (Guess there’s no ironing in your underwear.) The designated space for bag storage is under the foot of the platform bed. 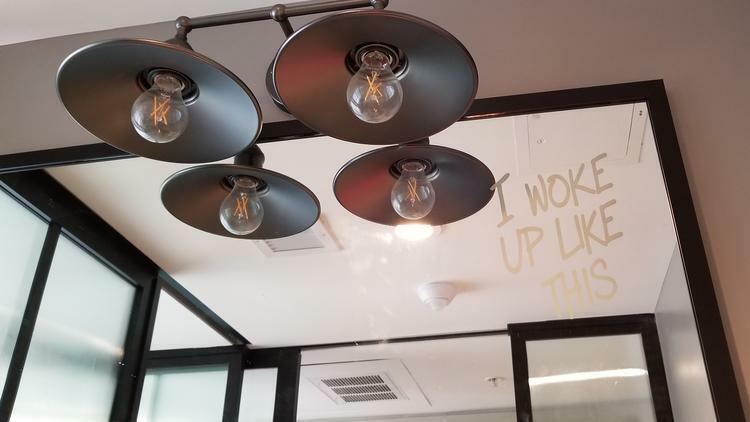 In the bathrooms, the mirrors feature a nod to the selfie, with “I woke up like this” scrawled in gold. The vibe they’re going for is fun — “spirited” is one word Sales Director James Rattray used. Check-in happens at the lobby bar, and there’s a free drink token that gets you a cocktail or a coffee. Social games like trivia and a mini version of beer pong are encouraged in the lobby. There’s also a foosball table, and they’re considering a board-room table that can be converted for pingpong. The cynical take on Moxy is that Marriott stuffed every bit of “#millennial” research out there into its new brand. Millennial pink! Canned cold-brew coffee! Music on vinyl! The more romantic view is that Moxy will capture many of today’s modern travelers, who, millennial or not, spend less and less time in their hotel rooms, like to work from active lobbies and crave genuinely local experiences. It also gives Marriott a hotel with a lower price point that fits better in urban areas than its more traditional Courtyard by Marriott and Fairfield Inn brands. Marriott bought itself some cool cred with the acquisition of Starwood Hotels & Resorts, though Moxy was a Marriott project before that deal was even contemplated. With the D.C. Moxy, it’s got a fair amount of competition in its immediate neighborhood as far as hipster hospitality is concerned — it’s right down the block from Eaton Workshop, a new brand that wears its progressive politics on its sleeve. It may eventually sit not too far from another one of Marriott’s more modern brands, the AC by Marriott, which is in talks to open in another Douglas Development project at Sixth and K street NW. Moxy D.C. aims to begin accepting guests this fall and the yet-to-be-named restaurants are expected to open in the spring.